Microsoft Exchange Online Protection (EOP) is a cloud-based email filtering service that helps protect Exchange users against spam and malware. EOP includes tools to safeguard organizations from messaging-policy violations. EOP runs within Microsoft data centres as a bundled provision for licensed Office 365 and Exchange users reducing problematic customer bandwidth risks, protecting email before delivery to all user devices, and simplifying the management of on-premise messaging environments and alleviating inherent costs that come with maintaining conventional on-premises hardware and software. Eliminates threats before they reach your business firewall with multi-layered, real-time anti-spam and multi-engine anti-malware protection. No extra hardware or software installation – EOP is a bundled service and runs from data centre, managing email before it is delivered to user devices. Protects your company’s IP reputation by using separate outbound delivery pools for high-risk email. Provides 5 financially backed SLAs, including protection from 100% of known viruses and 99% of spam. 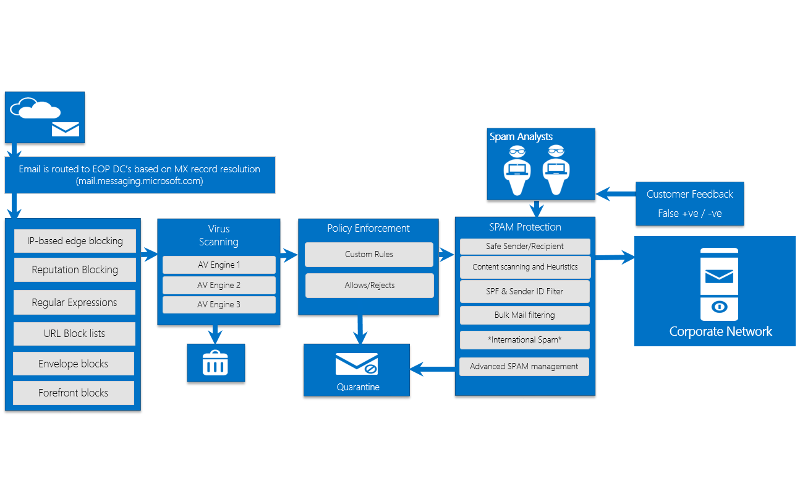 Active content, connection, and flexible policy-based filtering enables compliance with corporate policies and public sector/IT departmental governance. Leverages a globally load-balanced network of data centres helps to ensure a 99.999% network uptime. Managed and administered from the Exchange Administration Centre with a single web-based interface.